TSAE understands what it takes to be an association professional. It’s about having an ambitious spirit, a servant’s heart and a drive to organize people toward a shared vision. But no association professional can to do it all alone. And that’s where TSAE comes in. We bring together a welcoming community of high achieving individuals who bring out the best in each other at all levels of their career, because ultimately, we are better together. Providing association professionals a community for collaboration, learning, and leadership growth. TSAE began in 1928 as Texas Trade Association Executives (TTAE). In 1956 TTAE changed its name to Texas Society of Association Executives. TSAE is comprised of more than 1,100 association professionals who represent Texas-based associations and societies and as well as corporations and firms that provide services to associations. 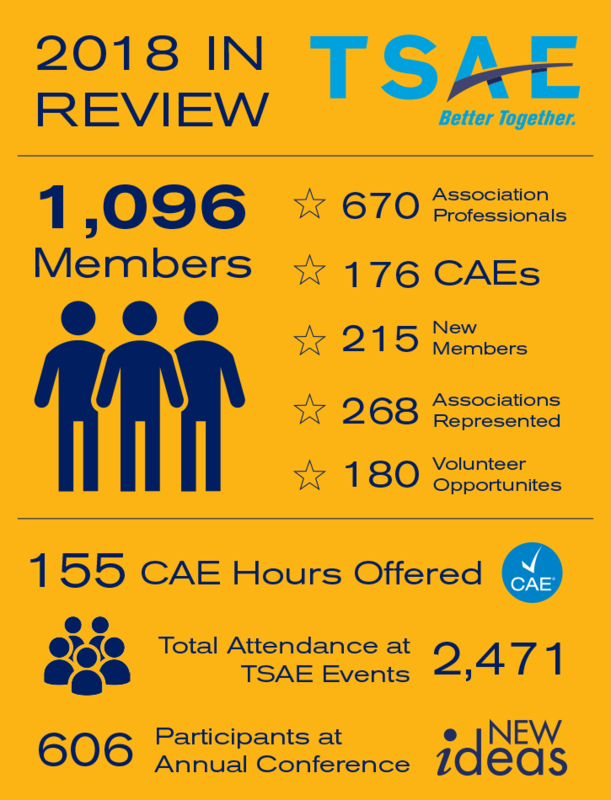 TSAE is a CAE Approved Provider. Every program that we offer which qualifies for CAE credit will clearly identify the number of CAE credits granted for full participation, and we will maintain records of your participation in accord with CAE policies. Learn more about the CAE Program. Whether you’re looking for your first job in the association industry or ready to take the next step to advance your career, the TSAE Career Center is a one stop place to search open positions and apply directly to a posting. Get to know the TSAE staff, our roles within the association, and areas of expertise so we can help you. We have a board of 19 dedicated association professionals who provide strategic direction and guidance for TSAE.